Almonds are used extensively in cooking and baking. Here's a round-up of Moroccan cookie recipes and sweets on the site which use almonds or almond paste. Some recipes call for skinning and/or frying the almonds; be sure to familiarize yourself with the process. 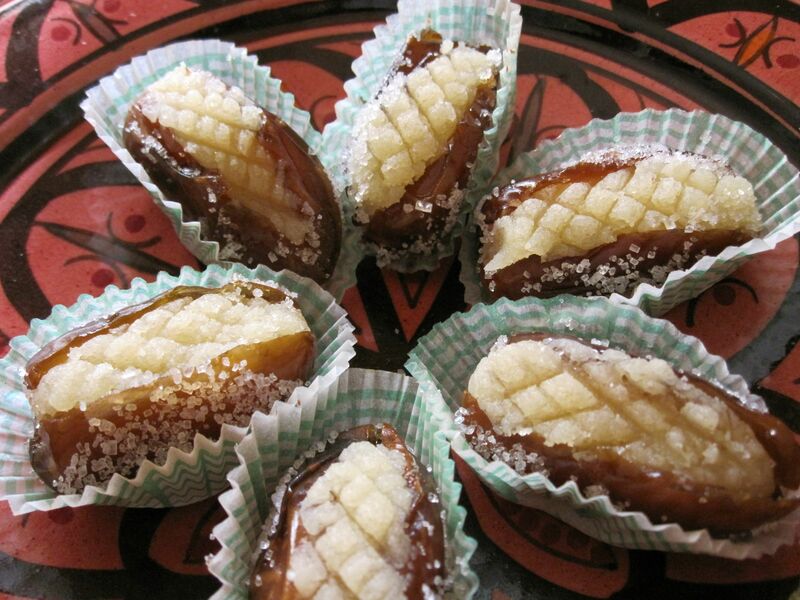 The almond paste filling in these stuffed dates is flavored with orange flower water and cinnamon. If you like, add some food color for a festive presentation. One of Morocco's most famous sweets, Kaab el Ghazal literally translates to "gazelle's ankles," but in English, they're more commonly called Gazelle's Horns. Either way, the names make clear reference to the cookie's characteristic crescent shape. The thin pastry dough conceals a tender almond paste filling flavored with orange flower water and cinnamon. Named for its snake-like coil shape, this baked Moroccan pastry is stuffed with homemade almond paste. A lovely presentation for special occasions. Chewy, Nancy-macaron-style cookies with rustic good flavor. Quite easy to prepare using storebought or homemade almond meal. No pistachios here – the Moroccan version of baklava (or baklawa) makes good use of almonds. A sticky, sweet, nutty delight. These delicious, cake-like cookies are easier to make than you might think. Semolina dough is wrapped around logs of almond paste, cut into pieces and then fried. A dip in honey flavored with orange flower water adds sheen and sticky sweetness. These almond paste-filled pastries are well-loved throughout Morocco. Although they might be offered for a casual tea time, they're most likely to be served when honoring guests, celebrating a special occasion, or when setting up a spread of food to break the fast in Ramadan. The dough for this Moroccan cookie is made with ground sesame and almonds, then shaped, fried and dipped in hot honey flavored with orange flower water. Almonds are key to this traditional Moroccan sweet, as are browned flour, sesame seeds, anise, and cinnamon. It's a popular offering during Ramadan, weddings, births, and other special occasions. Paper thin rounds of fried or baked warqa is layered with pastry cream and chopped fried almonds. Fresh fruit may be added. It's a very traditional and elegant dessert to offer after a Moroccan meal.